Hi, welcome to my Patreon page! 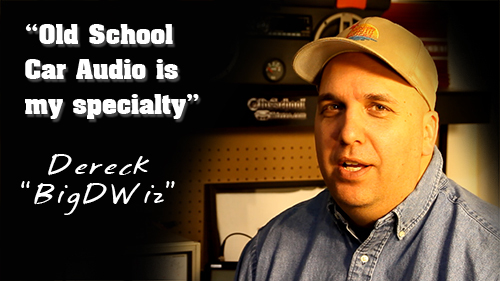 My name is Dereck, aka "BigDWiz" and I'm known mainly for my expertise in old school car audio and amplifier testing. I started my YouTube channel, BigDWiz, back in 2006, but didn't start actively uploading videos until around 2009. I grew up in what I think was the "golden age" of car audio....the late 80's and early 90's. I decided to start showing off videos of the older car audio equipment I used mainly because I wasn't seeing anyone else doing it on YouTube. Did you ever drool over a chrome plated Rockford Fosgate Power 1000 Mosfet back in the day? Much like classic cars, classic car audio is becoming very popular and I enjoy showing off the equipment and talking about the details. We test and overview amplifiers, speakers, tape decks, CD players, processors and more from the 70's through early 2000's. Patreon is a great way for those who can afford it, to help out with the ongoing costs of creating videos. I've spent several thousands of dollars buying cameras, microphones, testing equipment and more to bring these videos to my followers. By supporting me here on Patreon, you'll not only help me continue to bring new and exciting videos, you'll also support the cost of the testing equipment, supplies, website, software licensing and even the electric bill ( my 240V power supply spins the meter like Clark W. Griswold's Christmas lights). The best part is you can be a part of the VIP club for as little as $1 per video! Call it a "tip jar" for OSS. As a Patron, you'll have inside access to the OldSchoolStereo Labs and see things I won't share with my YouTube or Facebook audience...such as early releases of new videos, exclusive behind the scenes footage and even access to a monthly Google hangout! Please don't feel bad if you can't afford to support me, I'll continue to offer free videos. I'm not doing this to become rich, I just want to have a way to offer special perks to those who help with the ongoing costs of making these videos. Do I have to pay in U.S. dollars? No! Pay in any currency! This site is based in the U.S. so everything is shown in dollars, but your currency will be automatically converted! What if you release 50 videos? I don't have that kind of money! Not to worry! Patreon lets you set a monthly maximum, so lets say you only want to donate a max of $10 per month, but you want to give $5.00 per video! No problem! Once I have uploaded two videos you will no longer be charged the rest of the month! How many "released videos" do you produce a month? I typically shoot for two a month. I may do more, so simply set up your monthly maximum if need be! I noticed it says "Per Released Video" what does that mean? Sometimes I like to upload random, funny or behind the scenes videos and I don't consider those my "premium content" so they are not "Released Videos" and I will not monetize them here on Patreon. This means you are only contributing towards the content that you love! Sorry man, I don't have much money! Thats fine! There is no obligation here! I am going to keep making free videos for you to enjoy, but even if you set your monthly max at $1 it would mean the world to me! Can I stop donating if I can't afford it? Of course! If you find the need to make a change in the future simply log in and change or cancel your account! Behind the scenes access to the OldSchoolStereo test labs. Find out what we are working on and give feedback. You will know what's coming up before it's publicly announced! You'll get notified and early access to my YouTube videos before they go live...be among the first to comment! Access to unreleased and extended length videos. I always have extra video footage from my amp tests, bloopers, etc. and don't share this with my regular YouTube audience. These videos will not count toward your contribution to Patreon (you are not "charged" for these videos), just a benefit of being at least a Silver member! I'll also put your name in my video credits to show you are a supporter of my video content. I'll mention your business name and slogan in the videos. Expect results as the OldSchoolStereo audience is full of dedicated supporters! Contact me at [email protected] for more details. I reserve the right to allow or deny any business, please email me before making a pledge. Thank you! This amount will help cover the basic needs to keep the OldSchoolStereo Labs online. Electricity, basic supplies, software licensing, website hosting and upkeep, cold drinks to keep me going, etc.